The land that the landowners have entrusted to our care is our top priority. Our philosophy of operations is to treat each farm with the care and respect as though it were our only farm. One of the ways we accomplish this is by having the partners involved in field operations, to stay in touch with what’s happening in the field. We are particular about each farming operation to maximize the crop’s potential and not to compromise the quality of the land. Weed control is very important to us. We intend for the fields to be clean and neat. In order to maintain roadsides and waterways, we generally spray the weeds soon after planting, and then mow 2-3 times during the summer. We mark and repair tile holes and keep waterways in good condition. We use strip tillage practices for our corn fields and conventional or no tillage for our soybean fields. We maintain and build fertility by soil type. Planting and harvesting operations are done in a timely manner. As a landowner, your relationship and trust is our most precious asset! We strive to have an open relationship with each landowner. We understand no two people are alike, so we try to be flexible and accommodate each landowner’s needs and wants. We believe every operation on the farm needs to be done promptly to maximize our potential. We control timeliness by adjusting the size and the number of machines that we buy. We keep our equipment fleet up to date, allowing us to keep maintenance costs low and take advantage of any new technology enhancements. 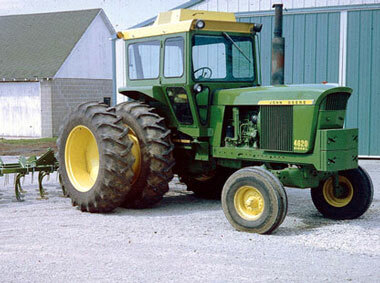 We currently use the John Deere line of equipment to meet our needs at Gingerich Farms. Technology is fully integrated with our farm operation. We use GPS to control auto-steering functions, operate swath control, and record spatial data maps of yield, variety placement, fertilizer placement and field operations. Our philosophy of life is to treat all people with honesty and integrity, doing unto others as we would have them do to us. By doing our farming operations promptly, it allows us to spend more time with our families, which we believe is very important. To honor the Lord’s Day, we do not work on Sundays. This allows the partners, employees and their families to be involved in various church activities. Community activities are also important, and we try to participate whenever possible. We consider ourselves to be blessed people with the rich heritage we enjoy and for the success we have. Technology is fully integrated with our farm operations. Using the RTK GPS signal we can have sub-inch repeatable accuracy to control auto-steering functions, operate swath control, implement variable rate prescriptions, and record spatial data maps of yield, variety placement, fertilizer placement and field operations. Every major operation on our farm is recorded, producing a GPS referenced as-applied map. 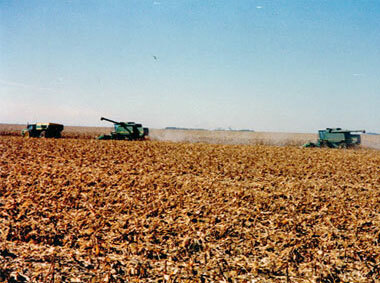 We also require any custom operators hired for any operation on our farm to use these same technologies. All precision farming operations begin with two components. A GPS receiver and a computer or controller. Gingerich Farms uses the Real Time Kinematic (RTK) signal as the backbone of our precision farming operations. RTK allows us to repeat any operation within centimeters of the original operation. We are currently using John Deere receivers to acquire this signal. The computer is the brain of precision farming. This computer can be uploaded with various software packages to control many different farming tasks. These computers can control several operations simultaneously if needed. The monitors on these computers are touchscreen to enhance operator efficiency. Gingerich Farms currently uses the John Deere and Precision Planting computers to control operations. We can currently control tractor steering functions (auto-trac), section control (swath control), and rate controllers with our computers. These computers also record many different measurements of an operation. These recordings are transferred to our office and uploaded into SMS to make colored maps of all operations done on the farm. 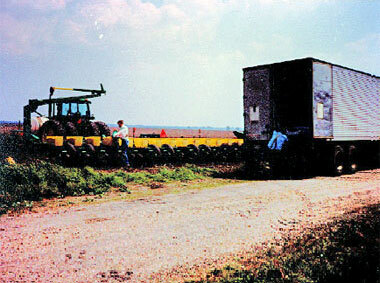 Auto-trac is an automated steering software that controls the tractors steering mechanism to follow a computer generated GPS referenced line spaced evenly across a field. This technology allows us to reach maximum efficiency from pass to pass as an overlap is no longer needed to ensure complete coverage. We can also record predetermined lines such as along the edge of a field. We then can follow this line at a later time, which makes controlled traffic pattern possible. Swath Control uses a geo-referenced coverage map recorded by the on-board computer and engages or shuts off operations so that minimal overlap occurs. We use this technology on our application equipment to minimize the costs associated with wasted seed, chemical or fertilizer. Gingerich Farms uses the SMS Farm Management Software to manage our GIS data. This program allows us to manage or create guidance lines, create boundaries for the swath control to operate more effectively, write variable-rate prescriptions for any operation to be done in a certain field. This software is also used to read all the recorded operations from the onboard computers in the machinery. These maps allow us to visually see what products and how much of it went in a certain spot. After the combine harvests the field a geo-referenced yield map is made, which allows us to see if a previously applied product is helping or hurting grain yields in a certain location of the field. The iPad and iPhone have been integrated into Gingerich Farms precision farming tools. The ability to load interactive maps onto the devices and to utilize the GPS signal to scout fields and check plots, has made us more effective in diagnosing and treating any issues in the field. These devices also allow us to return to the same spot in a field at different growth stages if needed. The History of Gingerich Farms and Gingerich, Inc. In 1960, Ed Gingerich rented his mother-in-law’s 80 acres and began farming. In 1962, Elva Gingerich bought his in-law’s120 acres and began farming. In 1969, the brothers realized that their personal resources would be of greater value if combined. This joint venture allowed the brothers to combine their expertise & assets allowing them to better their position of labor, finances, personal contacts, and also combined their similar goals. Farming 770 acres, the brothers began to grow the farm on the guiding principle of honesty and integrity to the landowner. Practicing responsible stewardship of the landowner’s land and providing accurate reports in a timely matter led to more landowner’s trusting Ed and Elva to farm their land. This growth allowed the brothers to spread their costs over more acres and allowed them to become more efficient. A factor that hindered efficiency was long lines at the local elevators in the fall. To avoid these long lines and allow timely harvesting, the brothers decided that they needed to build a grain storage facility. 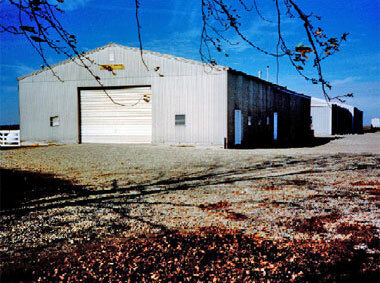 In 1976, the decision to build this storage facility was made. This allowed the brothers to get grain unloaded faster than before. With the ability to store grain, the opportunity to market grain directly to the processor became an option. Trucks were bought for transportation of the grain to the markets, and soon the opportunity to haul grain for local farmers and elevators became available. The brothers then started a trucking firm, Gingerich, Inc. 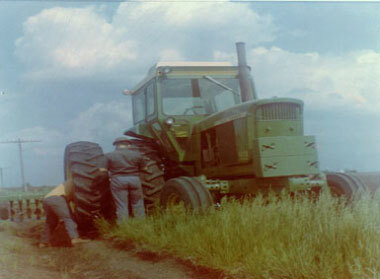 The growth of the farm through the 1970s and the addition of Gingerich, Inc. presented a need for more labor and management. To meet these needs, Ed and Elva decided to make their sons partners in the business. 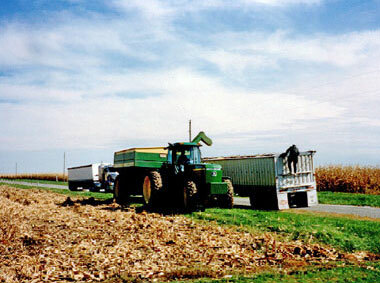 In 1983, Gingerich Farms was formed. This partnership was between Elva, his sons, Glen and Dannie, in addition to Ed, with his son, Darrel. 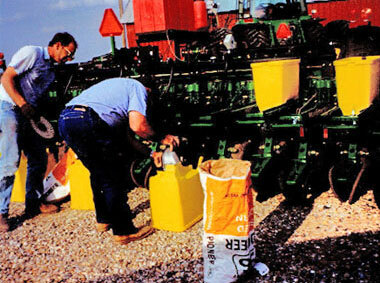 This partnership unknowingly prepared the operation for a large ground acquisition in 1985 which helped propelled Gingerich Farms to new levels of economics. 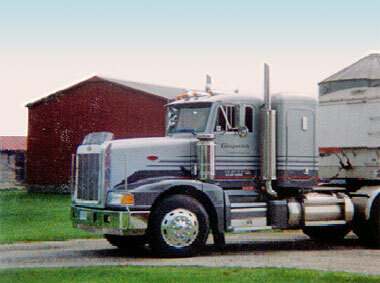 In 1995, Glen left the Gingerich Farms partnership and started his own transportation business. In 2001, Elva retired, leaving Ed, Darrel, and Dannie as the owners of Gingerich Farms. 2011, Ed retired from the farming operation. In 2012, Dannie’s son, Aaron and his wife Charity, became the third generation of the Gingerich family to become involved in the ownership of Gingerich Farms. 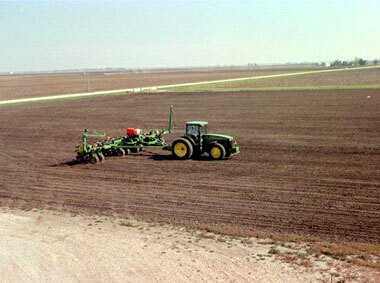 In 2012 Gingerich Farms began to integrate striptill methods into the farming operations. Gingerich Farms has continued to grow its land base. We continually update our current infrastructure, while adding new technology to meet the needs of our operation in order to adapt to changes in agriculture.